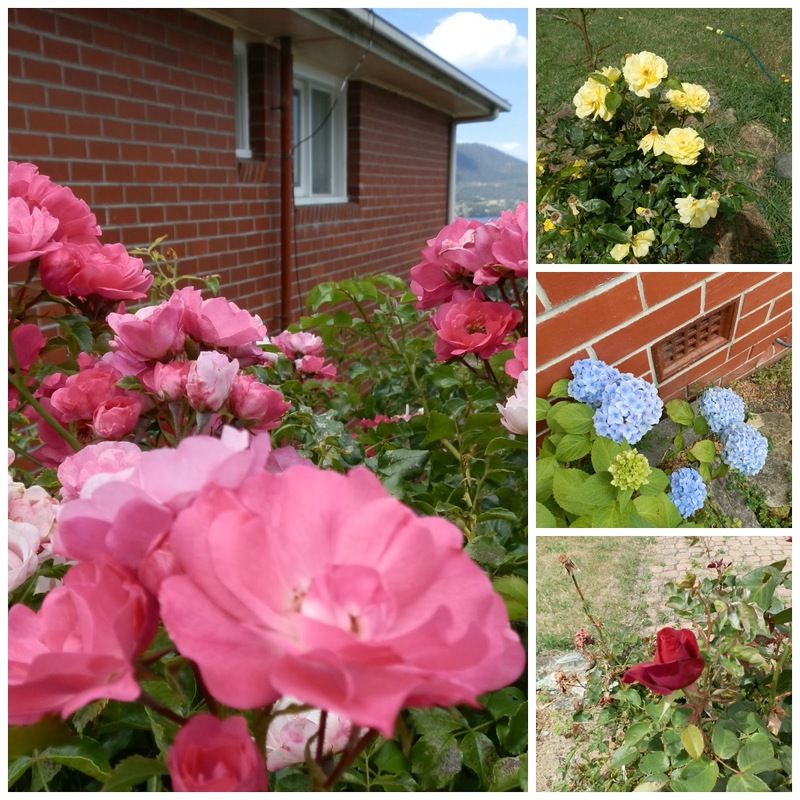 Thought I would show you some of the things we got up to in Tasmania. Our reason for going down was not only to attend the wedding of our niece but also to catch up with Chris's Dad, Ken. He is 92 now so we hope to visit a little more often. He is wonderful for his age. He still lives in his own home, does most of the work around the house himself, has a wonderful garden with lots of fruit trees and veges growing, cooks his own homemade soup weekly and Anzac biscuits and bread several times a week. He also stews his own fruit from the trees. 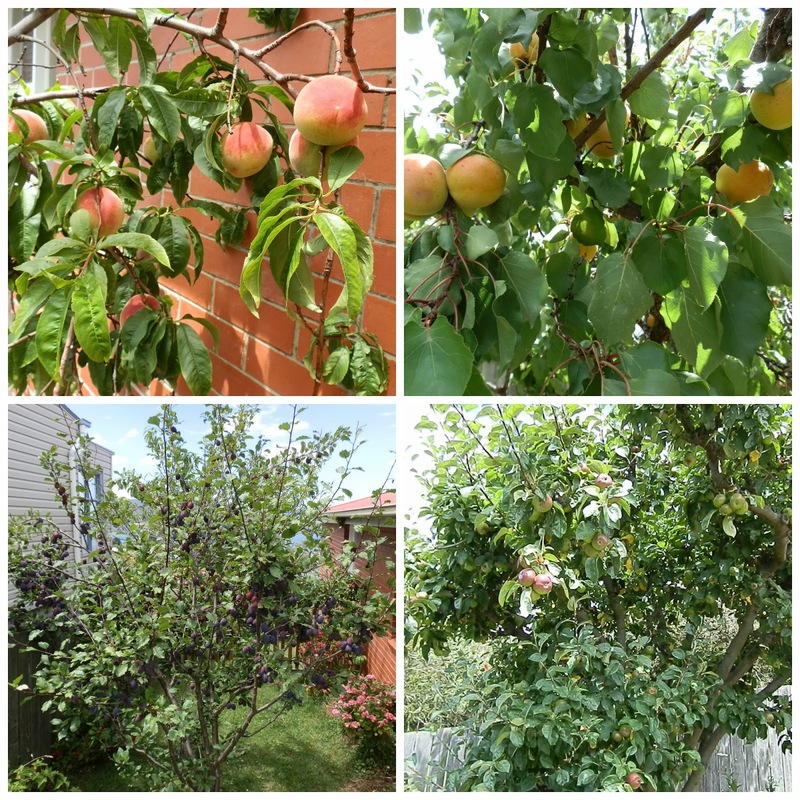 It was wonderful to be able to go into the back yard and pick an apricot or a peach and eat it. Peaches,apricots, plums and apples above. Also has pears and nectarines, all in a small suburban back yard. On Tuesday, we took a run up to George Town to visit Patchwork Plus. It was lovely to meet Sarah the owner and see her new shop. I managed to buy a few goodies including a roll of Zpagetti. Sarah showed me how to knit a scarf using your arms (tutorial on U-Tube). Now haven't had a go yet but it is on my to do list. I also watched a quilt top being quilted on her Gammill. It is a wonderful shop so if you are ever up that way it is well worth a visit. Here's a picture of Sarah's shop below on the right. Above are some of my purchases, ball of Zpagetti, a French General jelly roll, Cottage Garden thread and a few other things not shown are already in use. 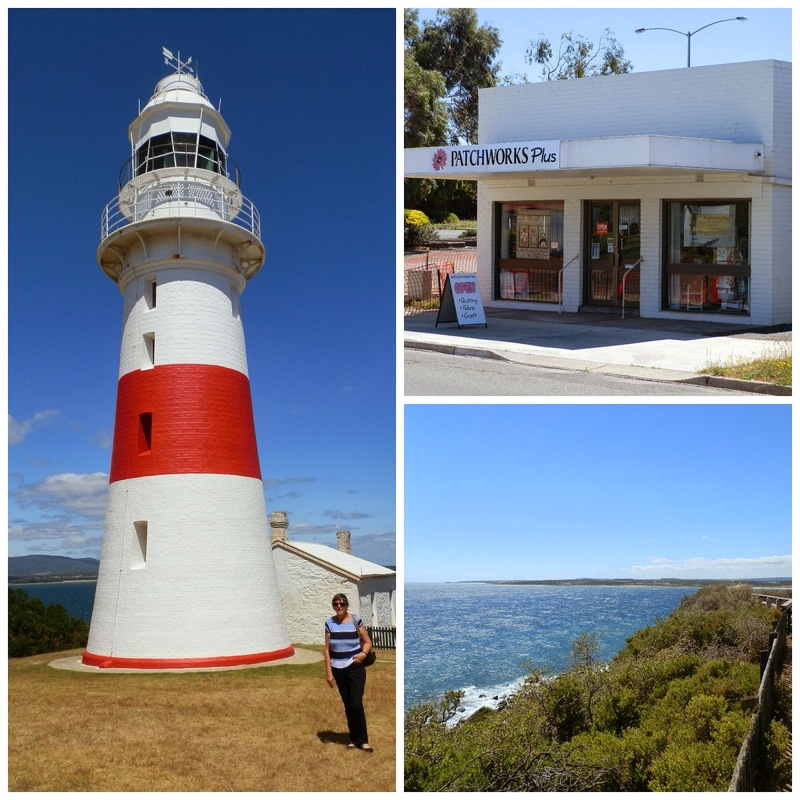 We went a little further and checked out the lighthouse and surrounds at Lo Head before heading back to Hobart. A big thanks to my hubby who didn't complain once about having to take me up there. His family couldn't believe we went all that way to visit a quilt shop. 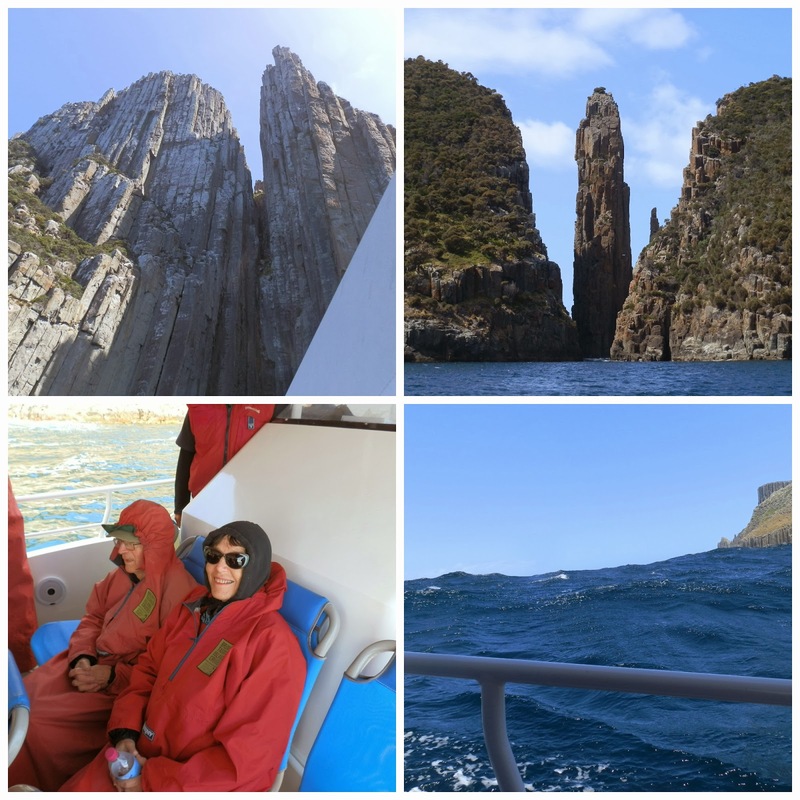 On Wednesday, Chris, Ken and I headed to Eagle Hawk Neck to join an Adventure boat tour down to Tasman Island. It was a bit windy with waves between 21/2 to 31/2 metres as we got closer to our destination. It was well worth the trip though as we saw 300 metre high cliffs with caves below eroded by the sea. 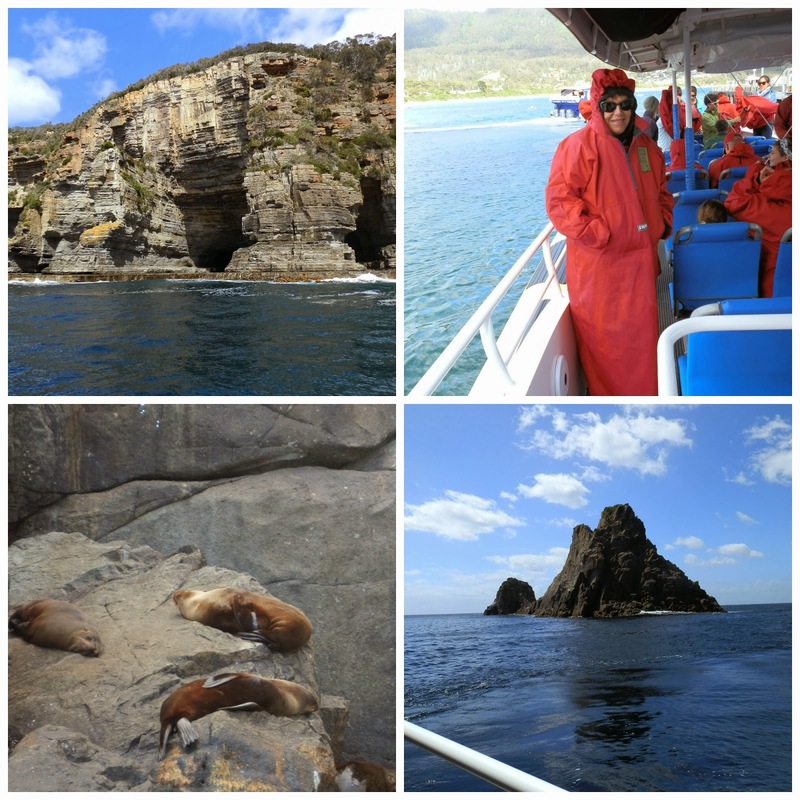 We were lucky enough to see dolphins, seabirds and albatross. Also saw a couple of seal colonies on the rocks. It was amazing to hear the history of Tasman Island and how they managed to get people, supplies, livestock onto the island so that the light house could be manned. The boat ride back through the waves was exciting. We did look very glamorous in our outfits, don't you think? Lastly we attended the wedding of our niece Kate and her now hubby Joe. The day was not the best and was the coldest of our stay. I'm sure the bridal party were freezing in their summery outfits. 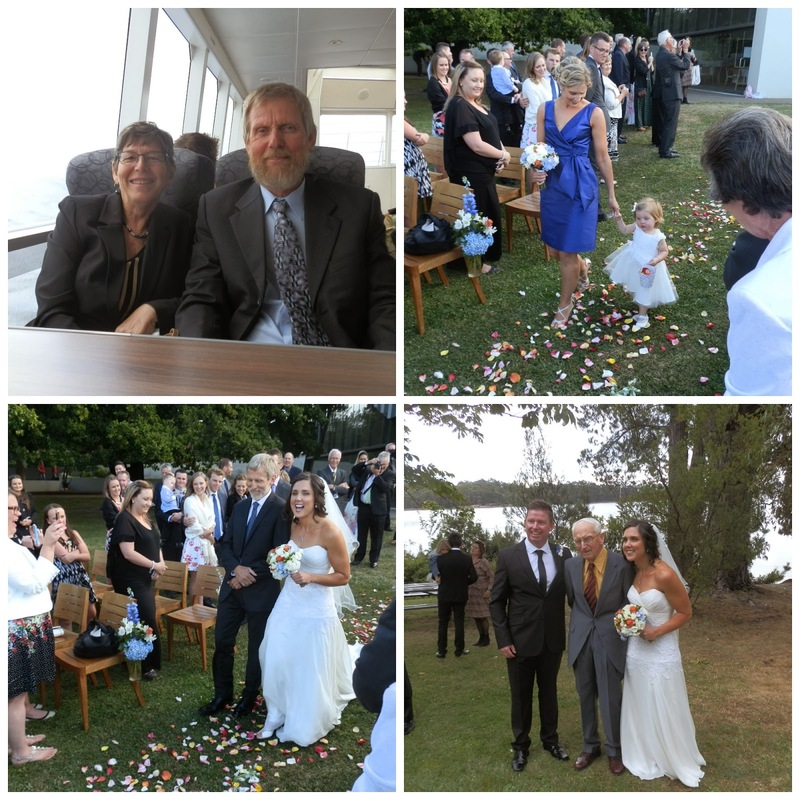 The wedding was held at Peppermint Bay and we caught the ferry down along with most of the other guests. Chris and I in ferry, Nicola & Evie (niece and great niece), Kate & her Dad, Joe & Kate with Grand-dad. I think we were all glad to get inside to warm up after the wedding ceremony was over. I am so glad we were there to join them for their special day. Well if you are still reading thank you for staying till the end. It is a very long post I know. Lovely pics and post the fruit trees and garden are amazing as is the owner Ken unbelievable !! Lovely photos Noela. Sounds like a wonderful trip. Nice purchases too! What a gorgeous bride. I had exactly the same colour for my bridesmaids 20 odd years ago! Love all your pictures. Looks like a wonderfully relaxing holiday! Lovely pics Noela. I'm looking forward to a Tassie holiday myself one day. Looks like you got to do lots of fun things (except for the big waves!). "all that way" to a quilt shop? - well of course you would go! Sounds like a lovely holiday. Tassie can be very cold in summer...and very hot. 92 and still gardening and cooking is great. Hope I can do that when I am that old...means I'll still be crafting too I hope. great pics, looks like you did a great variety of things on your trip. Sounds like a great trip! Ha! a quilter would go to the ends of the earth to visit a quilt shop....bet it was a good trip all round. Lovely post Noela. What a wonderful man Ken must be and so great he is still so active. Lovely looking at the photos, Noela. Sounds like you two fitted in an amazing amount of things into your holiday! I loved reading about your tassie trip Noela - bad luck about the cold day for the ceremony - who would have thought it in Oz in January - but that's Tassie for you!! Hello Noela, Oh I'm sorry I never knew you were coming to Tassie, we could have met up for a coffee. Isn't Sarah's shop beautiful, we go there for regular sewing days. Glad you had a good time. What a lovely trip away Noela, your FIL sounds incredible for 92! A beautiful wedding, and some great touring around and seeing the sights. Lovely pics of the wedding.... lucky you purchased the jacket! !